Garden Gnome Publications was started to fill a niche in the digital publishing market. They like to straddle the fence between satire and horror. Dark and light. Weird and mainstream. 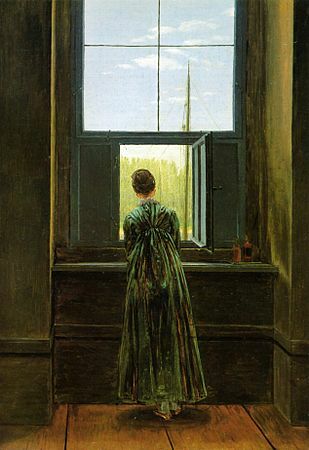 Frau am Fenster (1818-1822) by Caspar David Friedrich. This image has the feel of what a beloved might look like. I plan to continue writing stories as long as Garden Gnome keeps putting out books in the Biblical Legends Anthology Series. When brainstorming what I wanted to write that fit 1) weird fic, 2) biblical, and 3) spec fic, I thought about how humans have always sought to explain certain phenomena they don’t understand as ghosts, memories of past lives, and multiple personalities or mental disorders. I decided to create my own theory that explains all these and more. The incorporeum are not aliens; they are creatures native to Earth who have been around since the Garden of Eden. They do not have physical form; they are incorporeal. The exist outside of linear time (Like Star Trek: DS9’s wormhole aliens) and can travel forwards and backwards at will. They have a symbiotic relationship with humans. They refer to their hosts as ‘beloveds’ and have thousands of them across time. About one in every five humans is the host to an incorporeum, but they rarely know it. Each incorporeum has only one host in each time period. If humans find that a certain location has unusually high EMF, people see wispy figures, and doors open and close with no physical influence, the theory is that there is a ghost, or the spirit of a departed person (or sometimes an animal.) In my stories, it is not a ghost, but an incorporeum. The incorporeum love their hosts dearly and may ‘haunt’ the area the beloved lived in for hours, years, or centuries after their death. If a person remembers the details of past lives, the theory is that the person is a reincarnation of that other person. In my stories, it is not reincarnation, but the incorporeum sharing memories of all its other hosts with its beloved. Sometimes they can even remember future lives. This so-called-theory of mine is pure speculative fiction. I absolutely do not propose that any of this is true, and I certainly do not intend to debunk the legends of ghosts or any other phenomena. I created the incorporeum because the truth is often stranger than fiction. Much of what is unexplained today might simply be unexplainable with the level of knowledge and understanding we now possess. Someday, we will find the answers we are looking for. And the truth will be something greater, simpler, and more incredible than we can currently imagine.